I bought myself a little something. 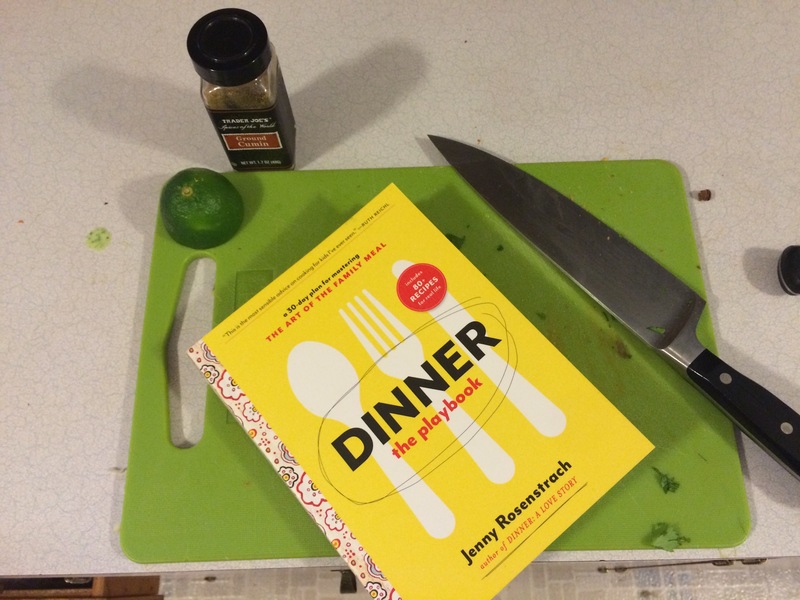 I have just about cooked Time for Dinner — of which Jenny Rosenstrach was one of three authors — into oblivion. It’s my most-recommended cookbook to anyone with kids. Things needed freshening up on the meal plan around here, so I picked up one of Jenny’s newer books. If you don’t already read her blog, Dinner A Love Story, I suggest you add it to your food blog rotation, pronto. I’ve cooked two recipes this week from Dinner: The Playbook, and they’ve been very well-received! The Slow-Cooker Korean Short Ribs were a huge hit, and the whole house smelled amazesauce all day because of the crockpot. I made sesame broccoli to go alongside, and served it over the Goya-infused rice I made for beans-and-rice night the day before. Yumtastic! Amelia had thirds. It makes a lot of meat, so I froze the leftovers to use later in Lettuce Hand Rolls (also known as “make your own dinner”) next week. I do like a flexible prepared protein! Slow-Cooker Korean Short Ribs over yellow rice. Also, sesame broccoli. That’s a green plate, huh? Here’s what the inside of the book looks like. 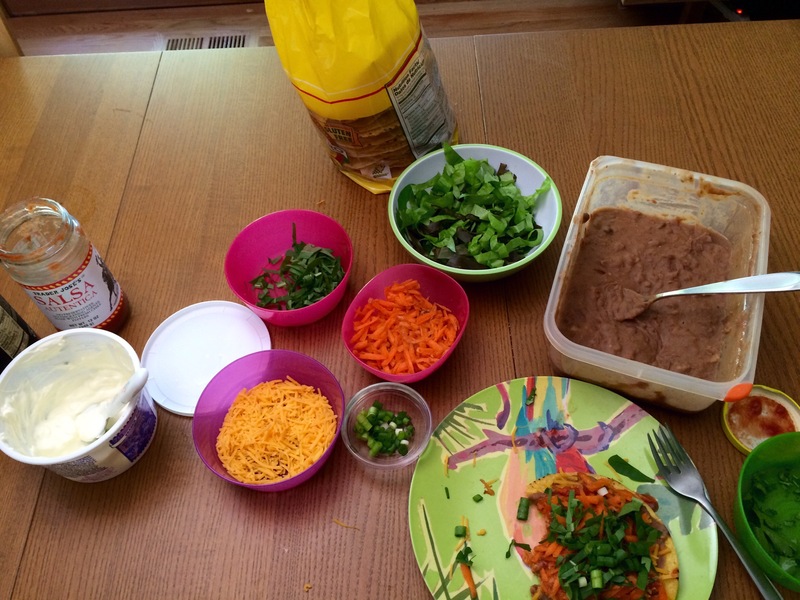 Then on Wednesday night I made the chorizo tacos. I used a really mild Longaniza for the chorizo, actually, since my kids are horrified by anything spicy ( and it was the only link style chorizo I could find at the grocery store). Yogurt-lime-cilantro sauce, shredded cabbage, avocado, longaniza, and corn tortilla ready to be filled with delicious. My taco *kind* of looked like this, when assembled. The concept of “make your own dinner” is one I adopted from Time for Dinner. I put a bunch of bowls of ingredients on the table, and everyone can assemble their own perfect meal — is a huge hit with my family. It exposes the kids to lots of flavors but reduces the amount of New Food left on their plates. We do multiple versions of this now: lettuce hand rolls, as mentioned, tostadas (which we had last night), baked potato bar, sesame noodles… and I think I’ll add the chorizo tacos to our rotation with a few edits (I’m the only one in my house who likes corn tortillas, put a bowl of cheese out and maybe some refried beans). If you have a table full of picky eaters at your house, I highly recommend “make your own dinner” night in all its many guises. It does produce more dishes than simply plating the kids’ food in the kitchen, and that is a total drawback, but I think it’s worth it.